This game is a Tamagotchi version of Pokemon in a nutshell. For that reason, it has been nicknamed PokeGotchi. (The name Japanese name of Pikachu Genki Dechu means Pikachu is feeling fine.) Your goal in this game is to train and raise your little Pikachu. What makes this game unique is you don't use a controller, instead, you use a microphone. 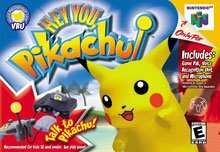 You speak to your Pikachu and give it commands. It seems that Pikachu responds to your voice. If you yell at it, it will go into a corner and hide. My only concern for this game is if computer voice recognition don't work well, why would this? But the bad news is, of course, that it costs a whole lot of a wallet! This game supports the rumble pack.